The Top 10 First Round Winners of the Pacific Humanitarian Challenge will be in Canberra, Australia March 29-30 getting coaching and support for the implementation of their projects in the Pacific Region. These First Round Winners have innovative projects that represent a new way to tackle disaster response in the Pacific Region, from new approaches to improve communications, to logistics to financial resilience. We’ll be hosting a live digital event from Canberra, Australia on March 30th from 1:00-1:30 p.m. (AEDT), if you’re in the U.S., that’s 7 p.m. PST, and 10 p.m. EST. Join us to share your thoughts and to find out more about the winners as we come to you live on YouTube (also embedded below) and Twitter using #RethinkingResponse. 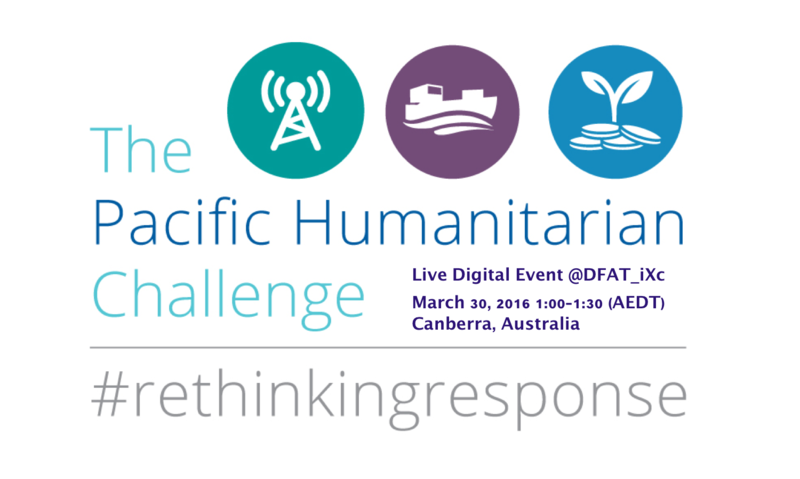 The main Twitter handles will be @DFAT_iXc and @SecondMuse. Co-hosting the chat will be Stephanie Kimber of the InnovationXchange at the Australian Department of Foreign Affairs and Trade and Neisan Massarrat, Open Innovation Lead at SecondMuse.